These days, it seems like tech is the face of everything. Our toasters come equipped with wireless communication and a little LCD display. Your thermostat can display your tweets. Heck, even your vehicle can integrate with Siri. As manufacturers use technology to make our everyday items intelligent, it can be hard for consumers to determine what features are truly useful, and which are simply a gimmick. We like to look at things from a different perspective. The best application of technology is one that makes your life easier. Our gadgets sound solve a common problem, in a simple way. Perhaps the best example of how this works is the Ekster Wallet. Looking at it, you wouldn’t notice that it’s anything special. But inside is some advanced hardware that you’ve never seen before in a wallet you own. But what exactly can it do? We went hands-on to find out. 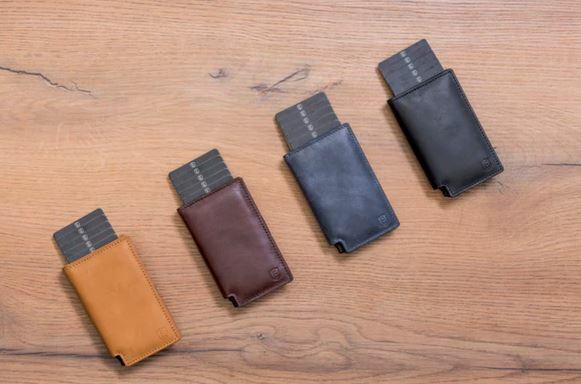 The Ekster is a series of wallets produced from a successful Kickstarter campaign. From the outside, they don’t look like anything aside from a standard wallet. 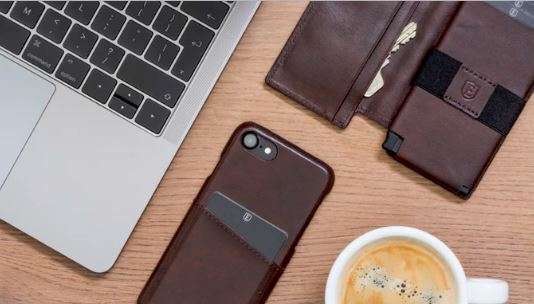 But there is some high-tech hardware buried inside that allows you to track the wallet wherever it may go, track your phone, access your cards more easily, and protect your bank cards from theft. On paper, this seems simple. But once you realize how well executed the design is, you’ll understand why it reached its funding goal in only 15 minutes on KickStarter. The Ekster is available in two different sizes. The Senate is the smaller of the two wallets. 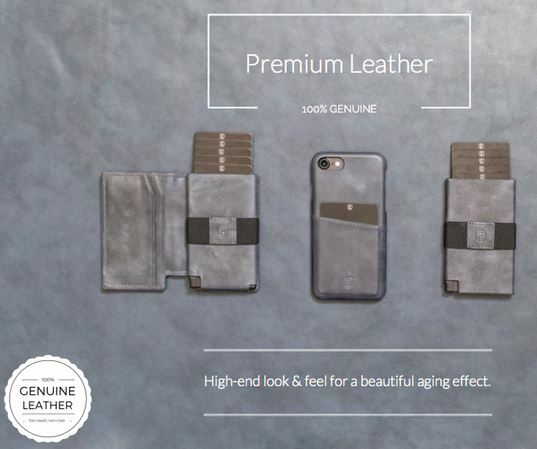 This model is very similar to the ultra-slim wallets that are in style. It measures 0.9 x 10.5 x 6.5 cm, or just a little thicker and wider than a small stack of cards. It’s basically a small plastic card holder that has been wrapped in a premium vinyl. Instead of unfolding it like a standard wallet, you shove your cards into the little slot. This keeps them secure while you’re out and about, and you only need to press the little tab on the bottom to push your cards back out. The wallet is wrapped with an elastic band, allowing you to store additional cards or cash underneath it. The Parliament is the next size up from the Senate. Internally, it’s the same as the smaller wallet. But it’s got a fold over flap that provides additional slots for cards, and has a bit more of a professional feel to it. Both wallets are available in our different colors: tan, red, blue, and black. Personally, we find that the red leather has the most natural leather look out of all of them. But all choices are very stylish, so you can appreciate the high-quality materials use. Overall, we noticed a significant improvement over the first-generation model. Although the layout is similar, even the largest Ekster 2.0 is half the thickness of the Ekster 1.0. 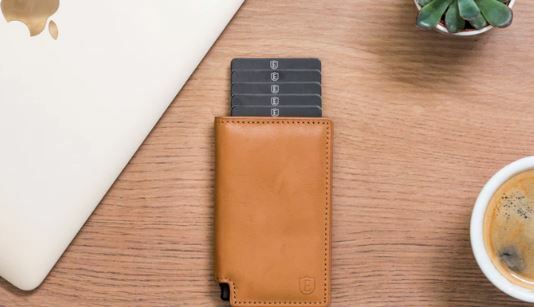 We found it comfortable to store in any of our pants pockets, making it a wallet we’d happily make a part of our every-day-carry. 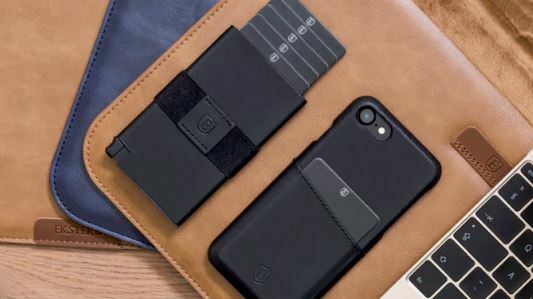 There are two places to store cards on the smaller wallet, and three on the larger model. Your important cards are stored inside the wallet itself. You can slip up to 5 of them into the port on the top, pressing the lever on the bottom to release them. One of the nice things about this lever is that it raises your cards at different heights. Like a set of cards spread out in your hand, it’s easy to pick and choose the one you want. We found it easiest to place the cards that you use the most towards the back, so it just takes one quick motion to lift them up from your wallet. All of the cards inserted into the center of your wallet are protected from RFID skimming. RFID is the technology that’s used in tap-to-pay technologies. Unfortunately, it’s possible for unscrupulous individuals to use a handheld device that can wirelessly download your card data, allowing them to clone it onto a new card and perform transaction on your account. But until you pull the cards from your wallet, RFID signal cannot pass through. This allows you to still use your cards, while keeping them secure. But what about information you want to pass through your wallet? If you need a proximity card to get into your workplace or home, an RFID wallet will prevent this from happening. This is why both wallets have a second slot on the back for proximity cards, so you only have to tap your wallet on the sensor to activate it. If you opted for the larger Ekster, you’ve also got two card slots in the face. These are a little larger than your standard card, so you can store receipts or paperwork in there if you like. Finally, you’ve got the elastic band that can be used to store cash. If you fold your cash in half, it matches the exact width of the wallet. You can easily store $100 or $500 in here depending if you use $100 bills or $20s. But you can also use this space for additional cards if you don’t carry cash. This is one of the most notable features of the wallet. 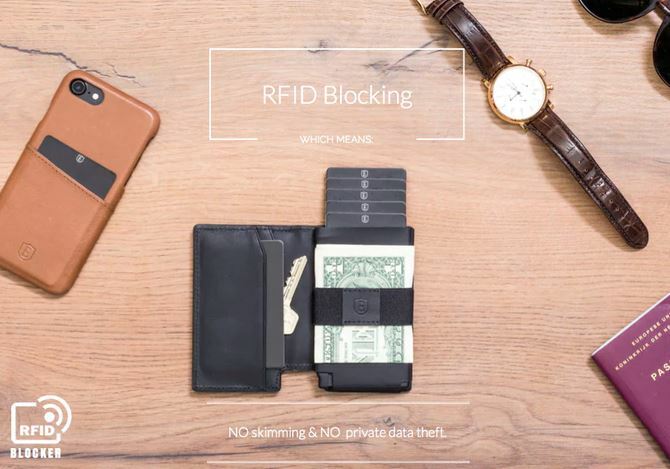 It includes a Bluetooth tracking card, which allows you to find your wallet if lost. This works in a similar manner to most Bluetooth trackers. You install the companion app on your phone, and if you ever lose your wallet you just hit the button to track it down. 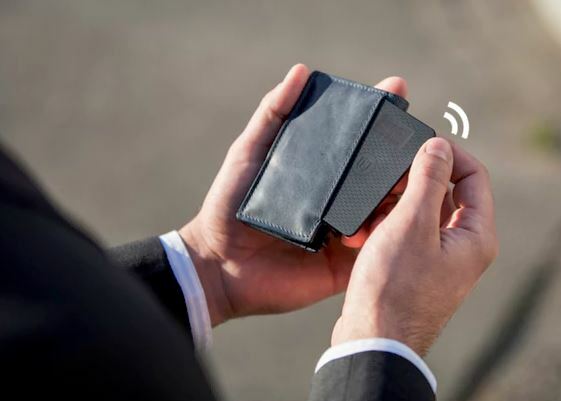 The wallet will begin to play a loud sound, so you can locate it within your house. One of the limitations to this technology is that your phone must be in range in order to detect the tracking card. The total range is about 100 feet, or 30 meters. But your phone is actually tracking the location of the wallet at all times. So, if you lose it, the phone will show you the GPS location where it was last in range. The tracking feature can work in reverse as well. The leather logo on the elastic band is actually a hidden button. If you lose your phone, just apply some pressure to this button and your phone will begin to make noise. This can save you from tearing your house apart if you’re trying to find a missing phone, and is a very handy feature to have. The tracking is all handled by an included card. It’s about the same size as a standard card, and has an ultra-slim battery installed. Unlike trackers like the Tile, this card is rechargeable. You can charge it through the build in solar panel. Just leave the card out in the sun for 3 hours, and you’ve got enough battery to last you for a month. One of our favorite features was the way that the Ekster spreads out your cards when ejected, so you can quickly grab the one you want. The only disadvantage to this system is that it requires exactly 5 cards to be inserted. You won’t be able to fit 6, and with 4 the mechanism doesn’t work well. For most users, it won’t be hard to find 5 cards. But if you don’t have them, you’ll want to pick up a gift card or something along those lines. Before we leave the house, we’re always on the lookout for two things: our wallet, and our phone. Thanks to the Eksters advanced tracking technology, you’ll never be without either of them. But what we liked most about this tech was how well integrated it is. It doesn’t feel like you’re using a high-tech wallet until you need it. From there, accessing its hidden features is as simple as pressing a button. But even without the high-tech features, we’d still be happy with the Ekster as just a wallet. It’s incredibly slim, allowing it to fit into any pocket with ease. The materials are expertly crafted from top quality components, making it a great addition to any back pocket. If you already have a wallet you love, and just want to add tracking features to it, you might want to consider a Bluetooth Tracker. There are a number of manufacturers for these devices, most of which can either slip into or attach directly to your wallet. We’ve done a review of the best Bluetooth trackers, with our personal favorites being the Tile Mate and the Mynt. I ordered parliament with a tracker which is $100. They sent me a defective product, tracker did not work. And as soon as you touch the wallet it scratches so easily. After emailing back and forth I sent back the product. It took 45 days that they could analyze product weather is defective or not. They also told me that the wallet has many scratches, but this is their product how quickly it gets scratches. In meanwhile they were holding my $100. So I requested my money back because did not want this product. They refused to refund my money because of their policy but they can hold my money no problem. Anyway, I asked them to send me Senate Cardholder instead parliament tracker and they refused that also. The only option they gave me, get the same wallet. Now, It has been almost 2 months I still do not have the wallet or money. Customer service is horrible. There is no phone number only by email and company located in Netherlands. They answer your email 3-4 days later. I will fight on this issue until I get my money or make sure that they don`t sell their product in the USA. 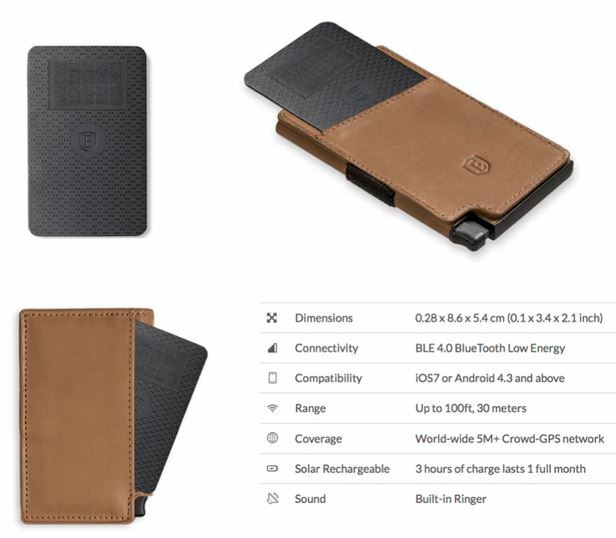 Im really stoked about spending a small fortune on a cheap wallet and a tracker that doesn’t work, and is actually pretty useless in the first place as its range is only about 10ft. Thanks for the garbage.